NASA's Aqua satellite provided an infrared view of Tropical Storm Lester that showed a lack of thunderstorm development around its center of circulation. 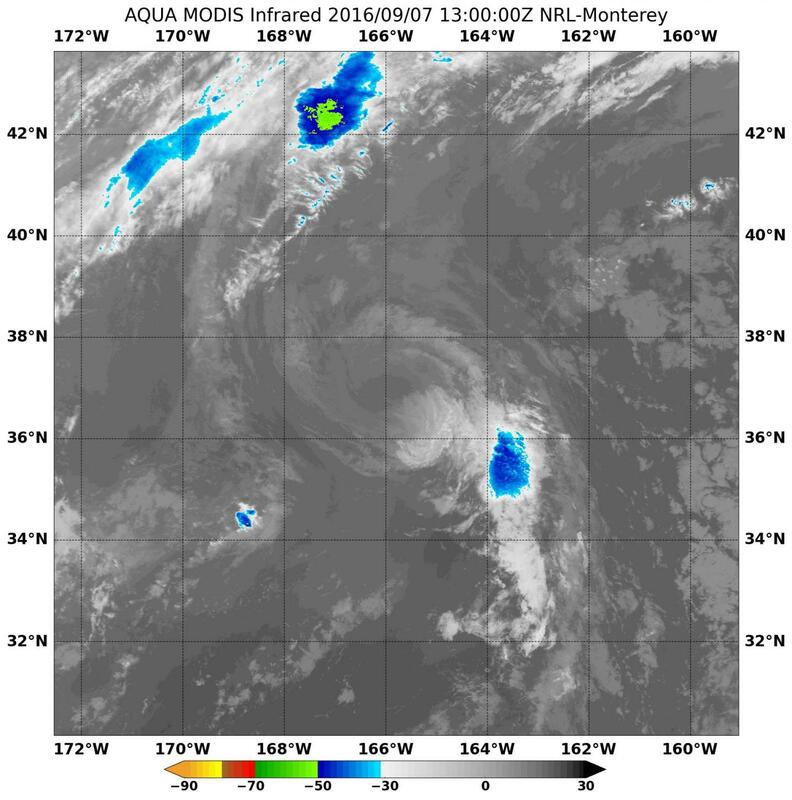 On Sept. 7 at 9 a.m. EDT (1300 UTC) the Moderate Resolution Imaging Spectroradiometer or MODIS instrument aboard NASA's Aqua satellite read cloud top temperatures in Tropical Storm Lester as it moved through the North Central Pacific Ocean. Animated enhanced infrared satellite imagery showed thunderstorm development had subsided around the center of circulation. A small area strongest thunderstorms and convection (rising air that forms the thunderstorms that make up the tropical cyclone) associated with the system were southeast of the center. That's because northwesterly wind shear is affecting the storm. The MODIS data showed cloud top temperatures south of the center were near minus 50 degrees Fahrenheit (minus 45.5 degrees Celsius). The infrared temperature data enables scientists to learn where the strongest storms are located within a tropical cyclone. The colder the cloud tops, the higher they are in the troposphere and the stronger the storms. At 11 a.m. EDT (5 a.m. HST/1500 UTC) NOAA's Central Pacific Hurricane Center said the center of Tropical Storm Lester was located near 37.6 degrees north latitude and 165.5 degrees west longitude, about 1,215 miles (1,955 km) north-northwest of Honolulu, Hawaii. Lester is moving toward the north-northeast near 15 mph (24 kph). A turn toward the northeast with a dramatic increase in forward speed is expected today and tonight, as Lester transitions to an extra-tropical low. Maximum sustained winds are near 50 mph (85 kph) with higher gusts. Little change in intensity is forecast today and tonight. Lester is forecast to dissipate on Thursday as it becomes absorbed into the circulation of a larger extra tropical low near the Gulf of Alaska.